Members of the geocaching community hide and maintain all of the geocaches listed on Geocaching.com. You can hide one too! How do I hide a geocache? Before considering your first geocache hide, we suggest that you find a variety of caches in your area. Seeing caches in a variety of locations, in different containers and hidden by a variety of users will help you understand what makes a great cache hide. This makes it more likely that you too will hide an interesting cache that everyone will enjoy! As you prepare to place your cache, review our Guide to Hiding a Cache and the Geocache Listing Guidelines. It is important that you understand these guidelines before submitting a cache for review. When I submit a cache for review how long does it take for it to be published? Each cache that is submitted to Geocaching.com is reviewed by a volunteer to ensure that the cache meets the Geocaching Listing Guidelines. It may take up to three days for the volunteer to contact you and make your cache live on the web site. Sometimes the volunteer will need to work with you to fine-tune the listing so it can be published. We kindly ask for your patience during this review process, especially on weekends when site traffic can be high. Geocaches vary greatly in size and appearance. In the field you will see everything from large, clear plastic containers to film canisters to a fake rock with a secret compartment. So, how do you find the cache? The first step is to get a general idea of the cache’s size. The size is shown on each cache page. A general overview of the cache size graphic is found below. Please note that these are just examples; sizes can vary. Micro – Less than 100ml. Examples: a 35 mm film canister or a tiny storage box typically containing only a logbook or a logsheet. A nano cache is a common sub-type of a micro cache that is less than 10ml and can only hold a small logsheet. Small – 100ml or larger, but less than 1L. Example: A sandwich-sized plastic container or similar. Regular – 1L or larger, but less than 20L. Examples: a plastic container or ammo can about the size of a shoebox. Large – 20L or larger. Example: A large bucket. Other – See the cache description for information. Small, Regular and Large containers typically contain trade items. To learn more about what to look for on the cache page and in the field, check out our video 5 Geocaches in 30 Seconds, these cache container photos, and read our guide. What’s usually in a cache? 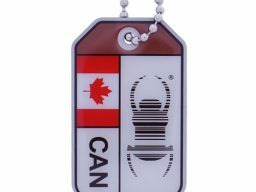 Quite often you may also find a Trackable, a sort of geocaching “game piece” that you can learn more about here. People of all ages hide and seek geocaches, so think carefully before placing an item into a cache. Explosives, ammunition, knives, drugs and alcohol should not be placed in a cache. Respect local laws at all times. Please do not put food or heavily scented items in a cache. Animals have better noses than humans, and in some cases caches have been chewed through and destroyed because of food items in a cache. How do I find the cache and what do I do once I’ve found it? There are many things to know about searching for a cache. For instance, did you know that there is a slight “error” to every GPS device due to technological limitations? Your device can get you close to the cache, but there are a number of things to consider as you get closer to the cache location. When you find the cache, sign the logbook and return it to the cache. You can take an item from the cache if you like – just make sure to leave something of equal or greater value in its place. When you are finished, put the cache back exactly as you found it, even if you think you see a better spot for it. Finally, visit the cache page to log your find and share your experience with others. Please do not move a cache from its original location. If you feel that the cache may not be located in the correct location, please email the cache owner directly or post a log on the cache listing page, notifying the owner of your concern. Cache owners are responsible for maintaining their cache placements. What should I do if I discover a cache has gone missing? If you visit a cache location and the cache is missing, make sure to log the cache with a “Didn’t find it” log so that the cache owner is notified. Cache owners who repeatedly receive “Didn’t find it” logs should check to see that their cache has not been removed. As a geocacher, if you notice that a cache page has an unusual number of “Didn’t find it” logs, please let the local reviewer know or contact us. We rely on the geocaching community to let us know the status of caches in their area. How do I log my find? Instructions for logging a “Found It” are located here. If you need to post another type of log, such as a “Didn’t find it” or a Note, the same instructions apply, with one small change; instead of choosing “Found It” in the drop-down menu, you would choose the applicable log type. This is the original type of geocache and the most straightforward. These geocaches will be a container at the given coordinates. The size may vary, but at minimum, all of these geocaches will have a logbook. Larger containers may contain items for trade and trackables. 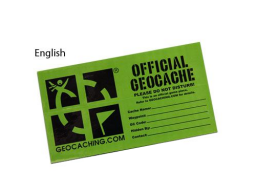 The “catch-all” of geocache types, this type may involve complicated puzzles that you will first need to solve to determine the correct coordinates. Mystery/Puzzle Caches often become the staging ground for new and unique geocaches that do not fit in another category. These geocaches involve two or more locations, with the final location being a physical container with a logbook inside. There are many variations, but typically once you’re at the first stage, you will receive a clue to the whereabouts of the second stage. The second stage will have a clue for the third, and so on. Letterboxing is another form of treasure hunting that uses clues instead of coordinates. In some cases, the letterbox owner has made their container both a letterbox and a geocache and posted its coordinates on Geocaching.com. These types of geocaches will contain a stamp that is meant to remain in the box and is used by letterboxers to record their visit. To read more about letterboxing, visit Letterboxing North America. An Event Cache is a gathering of local geocachers or geocaching organizations. The Event Cache page specifies a time for the event and provides coordinates to its location. After the event has ended, it is archived. A Mega-Event Cache is an Event Cache that is attended by 500+ people. Many Mega-Events offer geocachers a day of planned activities. There are often several days of additional activities surrounding a Mega-Event. These large events attract geocachers from all over the world and are often held annually. This is one of the rarest geocache types available. A Giga-Event Cache is an event that is attended by 5000+ people. These events are similar to Mega-Events and may include activities, could last several days and are usually held annually. Since Giga-Events are so rare, they attract geocachers from all over the world. The Geocaching HQ Geocache is located at Geocaching HQ in Seattle, Washington. Geocachers interested in visiting HQ to log the geocache should make an appointment at least 48 hours in advance via hqvisits@geocaching.com. Appointments help us keep Geocaching HQ running smoothly. Visits are available Tuesday through Friday, from 2–3pm. For the ultimate HQ experience, we recommend scheduling your visit for Friday. A find of this type represents attendance at the GPS Adventures Maze Exhibit or a regional variation. GPS Adventures Mazes are designed to teach people of all ages about GPS technology and geocaching through interactive science experiences. Welcome to Geocaching HQ Research & Development. A Lab Geocache is an experimental and extremely rare geocache type. These geocaches are a way for us to innovate and test—often at the molecular-level—new ideas to make geocaching even better. 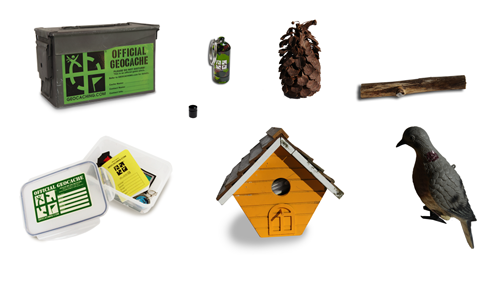 By finding a Lab Geocache, you’re helping shape the future of geocaching.